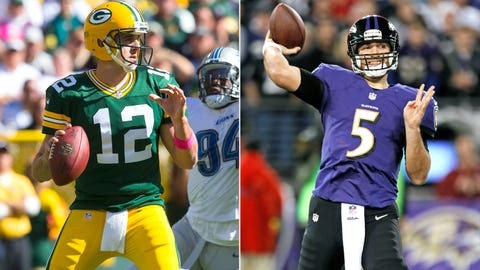 QBs Aaron Rodgers (left) and Joe Flacco are in must-win mode to make the playoffs on Sunday -- with the Ravens also needing outside help to claim the AFC's No. 6 seed. 1. Of his last eight healthy seasons (excluding 2011, of course), Peyton Manning has only participated in three ‘meaningful’ games for Week 17. Of those outings, he averaged 283 yards passing and 2.7 touchdowns. Sidebar: With the Colts, Peyton passed for 95 yards in three straight regular-season finales (2007-08, 2010). 2. Of his last 10 games against NFC East foes, Eagles tailback LeSean McCoy (2,010 total yards, 10 TDs) boasts robust averages of 116 total yards and 0.5 touchdowns. 4. Panthers QB Cam Newton, who hasn’t registered a three-TD outing in five games (gasp! ), has a stellar track record against the Falcons, holding four-game averages of 297 total yards and 2.5 touchdowns. The Bills have averaged 166 team rushing yards in their last four games — with three outings of 190-plus yards. 7. Redskins receiver Pierre Garcon (107 catches, 1,290 yards, five TDs) has collected double-digit targets in nine straight games — easily the longest streak of the season, among wideouts. 8. Rams rookie Zac Stacy (eight outings of 100 total yards and/or one TD) could be in line for a good day against the Seahawks, assuming he doesn’t sit as an injury precaution (leg). The Seattle defense has surrendered 130-plus team rushing yards five times since Oct. 28 — the same night St. Louis generated 200 yards on the ground in a close-shave loss to the ‘Hawks. 9. It’s impossible to predict how Aaron Rodgers will fare in Sunday’s winner-take-all clash against the Bears — based on his seven-week injury absence (broken collarbone) and hot-and-cold track record against a major rival. Of his last six career starts at Chicago, Rodgers racked up 300 total yards and/or three touchdowns three times. 10. How’s this for semantics: Of his 11 career starts against the Bengals, Ravens quarterback Joe Flacco (3,720 yards passing, 19 total TDs) has never reached the threshold of 300 yards passing. Of course, he finished with 299 in Baltimore’s season-opening win over Cincy last year … but hey, 300 is 300. What’s more, that outing from September 2012 represents Flacco’s performance outlier against the Bengals: Of the 11 career starts, Flacco has passed for less than 200 yards eight times.